• The highest point of your tree design. • All bonsais need an apex to look natural, even windswept and cascade styles; forest styles need one apex for the tree group. • Literal translation of the Japanese word bonsai is "tree in a tray". • A tree grown into a miniature size, and planted in a shallow bonsai pot which was designed for the purpose of displaying finished bonsai. Beautiful clay bonsai pots are a physical and visual aid in the miniaturization process. • Shallow training pots are usually plastic or mica. Regular terra cotta is fine too if shallow. • A bonsai can live for hundreds of years, and the older they are, the more treasured and more expensive if for sale. • A bonsai does not have to be old to have the look of antiquity; the illusion of age is a goal accomplished by using bonsai techniques. • Bonsai techniques were invented primarily by Chinese and Japanese artists. • Techniques are used to simultaneously style and miniaturize a tree. • A good book with illustrations is not only fun, but you can design and work at your own pace. A class is good too, but may not be available in your area. There are many books on the care and growing of bonsai including books by international bonsai masters. Starting with a basic manual will get you started well and more economically. • Cone-bearing trees such as junipers, cedars, and pines. • Some popular conifers for bonsai are the evergreen Mugho Pine, Japanese Cedar, Shimpaku Juniper, Japanese Dwarf Juniper, Japanese Black Pine, Ponderosa Pine, and California Juniper. • Trees which drop their leaves in autumn for the dormant season. • Leaf colors of the four seasons are a special interest in bonsai. • Some popular deciduous trees for bonsai are maples, elms, wisteria, oak, ginkgo, crabapple, and quince. •Pomegranate will lose its leaves when grown in non-tropical zones. • All but a few conifers are evergreen. • Bald cypress, which thrives in the Southern U.S. is popular for bonsai and is a deciduous conifer. Needles turn a rust-brown and drop. Bald Cypress grows in swamps. They can be grown in water as bonsai. • During the winter season, outdoor plants are in a dormant phase - they are taking a rest from the active spring/summer growing season. • Plants that keep their foliage all year whether a broadleaf or with needles. • Popular broadleaf evergreens for bonsai are Boxwood, Japanese Holly, Ficus, Nandina. See "conifer" above for evergreens with needles. • Trees which are native to a geographical area are indigenous to that area. • Gathering information is easy when using indigenous plants. • Naturally dwarfed indigenous trees have a better chance of survival from being dug up and moved. • A plant which is suitable for or has been made ready for the horticultural practice of bonsai. • A water-bearing plant - can go a week to a few weeks without water depending on type and size of plant and soil drainage. • If smooth leaves crinkle, time to water. 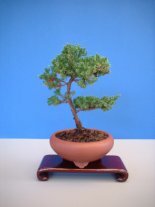 • Jades and Portulacarias are often used for bonsai. • Trees dwarfed “in the wild” by natural circumstances. • They can be found virtually any place where conditions are testing a tree's ability to survive. For example: harsh weather conditions such as wind, snow & ice, lack of sunlight, growing in rock with little soil, and high altitudes. See article "Yamadori". • A dwarfed tree can be found in a yard, but it does not qualify for the name yamadori if it has been watered with a lawn and shrubs! That makes it almost “domesticated” - the tree has not survived adverse conditions totally on its own in the wild though it may be good material for designing into bonsai.